I simply adore vintage linens! And can spend quite literally hours rifling through them at the trade fairs. My husband knows there is no use talking to me or even waiting for me when I come across a linen stall. In France they are so crisp and neat, beautiful! In England it's a rummage of softness with the odd crinoline lady in all her embroidered glory. I do end up keeping a lot of my finds and reusing them in my creative makes, I take inspiration from the faded chintz of a vintage piece and recreate them in my soft watercolours. 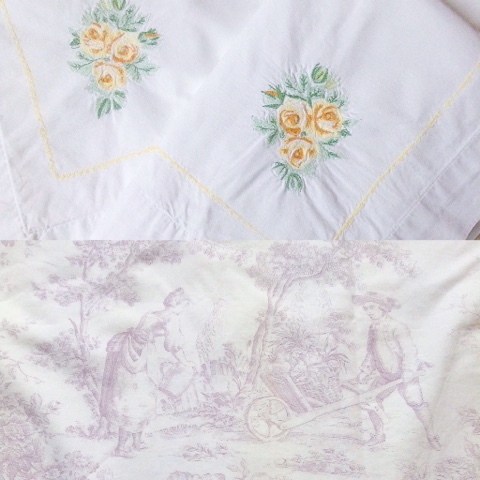 My latest finds- a pretty pair of vintage Laura Ashley pillow cases, and a pair of time worn and faded toile de Jouy lavender curtains, both available from my store Emma Connolly Couture (shop link on page). Old cotton has the most amazing smell! It reminds me of my nans airing cupboard, piled heigh with gorgeous softness in all shades of pastel. When I've completed a watercolor that I've painted for a fabric design I have it printed on at least three cottons and one linen to see what looks best, I nearly always prefer the heavy cotton drill, it reminds me the most of soft vintage fabric..... dreamy!